Before you begin or broaden your teddy bear collection, there's a few things you should know. Learn the year the bear was made, country of origin, the manufacturer or designer, and any distinguishable labels and features so you are a knowledgable collector. Most antique collectibles are defined as 100 years old or more; for teddy bears, however, anything dated on or before 1940 is an antique. If you are a bear novice, one thing you can't do is generalize and say that all teddy bears look alike, are made with the same materials and are all the same color. Like humans, these adorable creatures come in many sizes, shapes and colors and are made in many countries. It's best to start out with one type: Bears made by a specific manufacturer, teddys made in a particular year or country, miniature bears, or those made by a certain artist. Get to know the many variations you may run into once you start to explore stuffed bears. The origin of the first bear dates back to 1902 in America and Germany, however, there is evidence that hand-stuffed animals were being made long before that time. 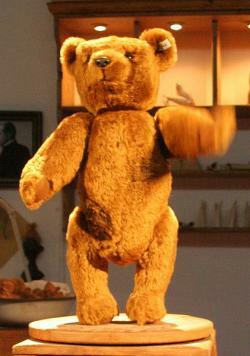 According to Patricia Hogan, curator of the Strong Museum of National Play, "... a well- researched book, Button in Ear: The History of the Teddy Bear and His Friends, by Jurgen and Marianne Cieslik, 1989, indicates that the company was making soft toy bears in the late 1800s and were not called 'teddy bears.'" Hogan said that the first bear "seems to have developed independtly in two countries at about the same time." Below are the first and most significant makers. 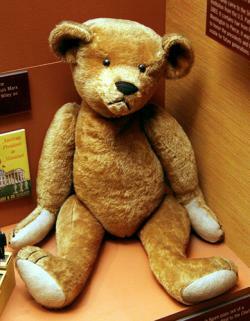 The first official American bear was "Teddy's Bear" named after President Theodore Roosevelt. While on an unsuccessful, three-day bear hunting expedition, the President's staff made light of his inability to make a kill. In jest, they tied a wounded bear to a tree so Mr. Roosevelt would have an easy target; his sportsmanlike character, however, would not allow him to do so. News of the bear-tying event spread like wildfire throughout the country. Well-known Washington Star newspaper cartoonist Clifford Berryman's illustration depicted the President holding his rifle while a small, toy-like bear stood behind him. 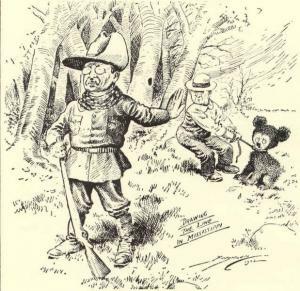 The Teddy Roosevelt Association says that this cartoon led to the birth of "Teddy's Bear." How Much Is That Teddy in the Window? Patricia Hogan, confirmed that Ideal Novelty and Toy Company (1902-1984) was the first to manufacturer the bear in America. Morris and Rose Michton, owners of a small shop in Brooklyn, were so inspired by Berryman's cartoon that they created a stuffed, cloth bear that held a sign that read "Teddy's Bear," and placed it in their store window. The bear was an immediate hit and a profitable venture for the Michtons, who went on to open the Ideal Novelty and Toy Company. 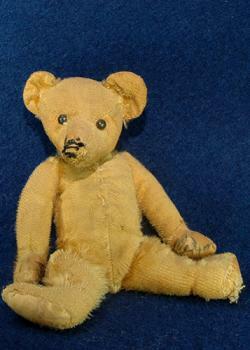 In 1907, the name of the bear officially changed to Teddy Bear, the name with which we all resonate. Bears became a very competitive business in the first half of the 20th Century. The numerous designers in America and Europe had the same goal, to design a bear that would be the most popular and generate the most sales. The only differences between American and European designers was the materials used, craftmanship and innovative ideas. Later trademarks: one shaped like a circus wagon and one marked "Ideal"
Steiff Manufacturing, operating from 1877 to present day, created two different teddy bears at the turn of the century as well. Seymour Eaton, inspired by the Roosevelt hunting story, wrote The Roosevelt Bears, ca. 1906, which featured illustrations of bears wearing clothes. Ken Yenke mentions in his article from Antique Trader, The World's Rarest Vintage Teddy Bears, that Eaton's book influenced Richard Steiff to design the Steiff Manufacturing Company's first teddy bears in 1904, Teddy B. and Teddy G. They sold for five cents; valued today at $1000. There may be just two left in circulation today. According to expert John Port in an article for the Santa Barbara Independent, Steiff bears can be worth up to $10,000. Cloth ear tags sewn into the chest area include "Steiff Original" as well as "Made in Germany" or "Made in US-Zone Germany" in white, red, beige or yellow. 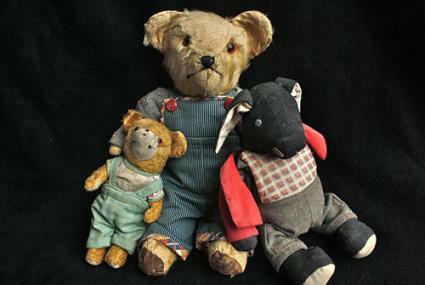 Oldest bears made from mohair, 1947 onward, synthetic fiber. 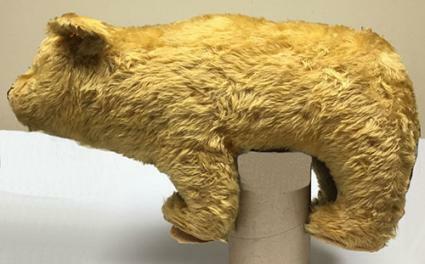 Original bears did not have moveable limbs; in 1905, moveable joints made from heavy card. Some of the first bears had buttons. One of Le Jouet Champenois' famous bears was named Pierre, ca. 1930. He stood 18" tall, is jointed five ways, the head is filled with wood-wool and body with kapok. Pierre's eyes were made from black and amber-colored glass, and a long, and slender body. No trademarks until 1925 which were a round card disc with a metal rim attached to chest that read "Alpha Made." Large bears have clear glass eyes, smaller bears black button eyes. Watch for these rare and valuable bears when you are looking to add to your collection. The first and oldest bear that survives, according to antiquetrader.com, is the Rod Bear who lives in museums and private collectors. The internal iron rods can only be seen with an x-ray; the most sought-after feature is the elephant button in his ear. Christie's sold a PB 28 Rod Bear for $49,871 in 2006. Most Steiff rod bears are valued anywhere from $10,000 - $150,000. A teal-colored English Farnell bear in great condition would be valuable. Yenke's Antique Trader article points out that one sold for $11,000 through Sotheby's in worn condition. A record-breaking $2.1 million was paid in 2000 at a Monoco auction for a Steiff Louis Vuitton Bear, designed with the Colchicine Fashion House. This gem of a bear lives at the Teddy Bear Museum in Jeju, Korea. Research and knowledge are key. There is a plethora of information on the internet to use for comparison, but when in doubt, seek out an expert. Note that while general advice can help, it's important to know the specific manufacturer details. Kovels offers a free online price guide you can access with a no cost sign-up to get a general idea of value. In an article written for Real or Repro, founder and publisher of Antique & Collectors Reproduction News, Mark Chevenka stated that the producers of fake bears are becoming more and more skilled in their craft. Below are a few basic things to look for that can help determine if your teddy is a real or fake. Know the history of the bear; this includes having original photos (can increase value) and documentation. Snythetic mohair is used in fakes and trimmed to appear aged, so watch for this when shopping. Staining is applied to also make it appear old. Rare colors other than the common white, cinnamon, or white and brown can increase value; one exmaple is the teal Farnell bear. Special features, like humps on 1930s German bears, oversized limbs, five jointed early bears, long noses, feet made of different fabrics, and eyes of black shoe buttons, can help date the bears and authenticate them. Labels are an easy telltale; some early bears had no labels at all, some had one version, others had several versions. Each manufactuer's trademark procedures was different. A bit of research will help you to distinguish this small element of determining authenticity. To determine the authenticity of your bear, you must know it's characteristics, which vary from country to country, manufacturer, and the date made. The Steiff Bear Guide provides an example of the many variations you may find for just one manufacturer. For example, 1904 bears had a metal button in the left ear that was made of brass, iron, or was nickel- or gold-plated with a body made of mohair. Eyes moved from shoe buttons to glass eyes, while claws changed from five to four pads from 1904 to 1906. Older bears did not move and had cloth ear tags or tags on the chest seam. There are many places to find antique bears. Collectors Weekly lists a vast selection of eBay auctions with pictures, Christies Auction has a Bear Sale twice yearly which you can attend or bid online. You can also locate fuzzy friends at flea markets, estate sales, and garage sales. Ruby Lane is another online source for collectors. Now you are official; you're ready to begin your journey into the world of antique teddy bear collecting. Rule number one: Know your stuff. All bears are not alike! Visit museums, join a Teddy Bear collector's group, speak with other collectors. Focus your collection on a specific category, country, manufacturer or year; then do your homework. Be cognizant of each bear's characteristics to avoid being fooled with replicas. Most importantly, have fun. You can find bears in any price range; the valuable bears listed are the bears for which to be on the lookout. Happy bear hunting!